Clint Heinze--Gas prices increased, forcing students to stretch their money even further. Gas prices are reaching totals not seen since 2008 as the price of oil climbs past $100 per barrel. The rise in oil costs led to higher prices at the pump. Most gas stations around the Inland Empire have bumped the price of regular unleaded gasoline to $4. Oil shortages in some Middle Eastern countries are what has been said to be the cause of this latest spike in prices. However, according to an article from The Huffington Post, the oil that is no longer available from Libya is only equal to one percent of the world’s total oil production. In an effort to keep prices somewhat under control, most large countries, including the United States, have vast oil reserves in the event that there is a disaster that depletes the oil supply. According to NationMaster, the United States had the 14th largest oil reserve at 22,450,000,000 barrels in the world in 2010. American oil experts focus most of their research on finding a way for America to become less dependent on the occasional and currently unreliable foreign oil producers. Hybrid vehicles and vehicles with higher fuel efficiency have made slight improvements to the United States’ fuel independence but not enough to prevent this latest rise in costs. According to GasBuddy, California has the third highest average gasoline price of any state at $3.960 per gallon. Riverside has one of the highest averages of any United States city at $3.940 per gallon. 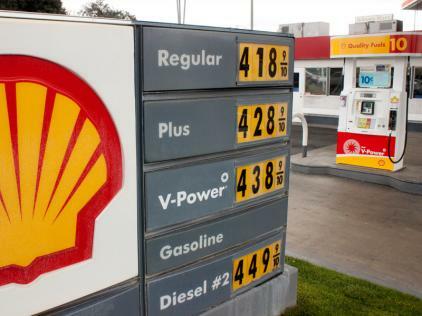 Since March 22, 2009 the average gallon of gas in the United States has risen from $1.94 to $3.53. These numbers can be important to college students, especially commuter students. “High gas prices have made it tougher for me to spend money on other things I really want, like food and clothing,” ASCBU Commuter Vice President Josefina Llanes said. The price surge does not affect only commuter students, however, because oil prices do not just make a difference in gasoline prices. Also according to The Huffington Post, other services may be affected by the oil price surge, such as flying because airplane fuel will go up in price, thus making individual tickets more expensive. Following along the same line is shipping prices. Whether the item is shipped via plane or truck, it will still take gasoline to get it to its location. In order to save money at the pump, it is important to shop around when looking to fill up the tank. Current technology makes it easy to find the closest gas station and the cheapest gas station. It is also important to practice good driving habits in order to maximize fuel economy. Most cars are made to achieve their best fuel economy at around 55 mph. Accelerating and braking slower also helps get the best fuel economy. Carpooling is another solution to rising gas prices because it saves gas and effort. “Carpooling is a great way to spend less on gas. Sometimes even just riding my long board instead of taking my car everywhere helps too,” Llanes said. The national average for a gallon of gasoline reached its highest point in the summer of 2008 at $4.12 and could reach that high again this summer. Following the steps above could help limit the effect these prices have on Americans’ wallets.